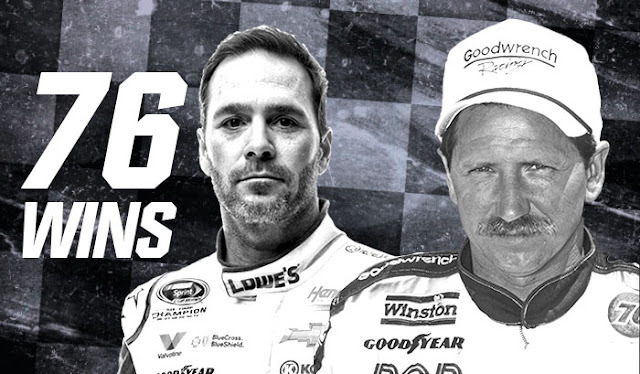 The career accolades on Jimmie Johnson's Wikipedia page already rivaled that of the all-time great athletes. Six-time champion (territory Michael Jordan is familiar with), five-time Driver of the Year (Mickey Mantle had three MVP awards) and he's the only driver to have qualified for the Chase every year since it's inception in 2004 (the kind postseason run Bill Belichick is familiar with). But with his win Sunday, Johnson found himself in truly hallowed company- tying Dale Earnhardt Sr. with 76 career Cup wins. "I don't have a problem calling him the best of this generation even as a competitor of his and having to go out there and race against him,"said Dale Earnhardt Jr.
NASCAR debuted its new low downforce package at the Folds of Honor QuikTrip 500 in Atlanta on Sunday- and the drivers loved it. "We were sideways, sliding around, the cars were moving," said Joey Logano, started 27th but raced his way into the top five without a caution. "This is real racing. We're driving hard. That's a tough race and just a lot of fun," said Carl Edwards, who finished fifth on Sunday. Almost every driver had glowing reviews of how their cars handled with the new downforce package in Atlanta, noting how it felt like a throwback to the racing of yesteryear. None were more explicit in their comparison than Brad Keselowski, who suggested the racing style might even inspire a new look for the Penske driver. 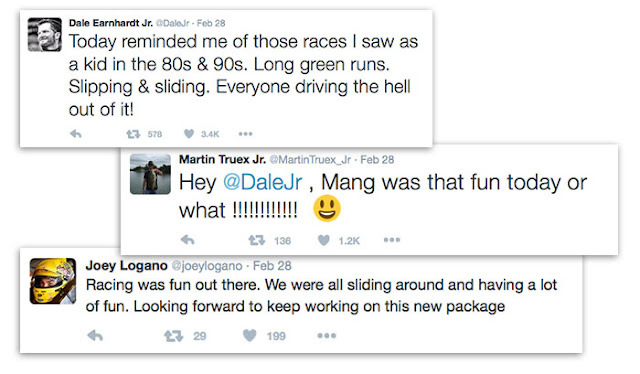 "That race felt like I was in 1975. That was kind of awesome. 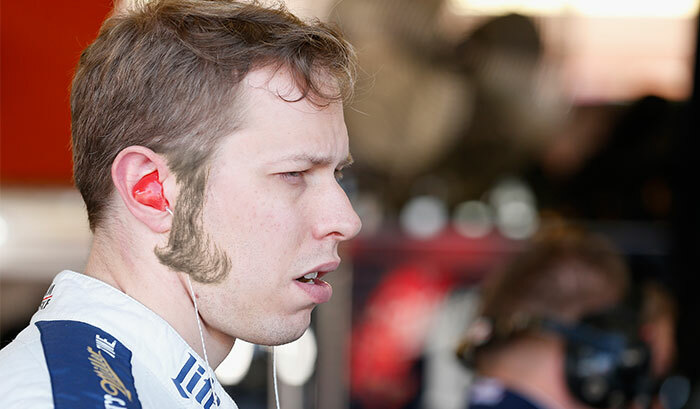 I should grow my sideburns out after that one." We decided to see what it'd look like if he did, and we think he could pull it off. 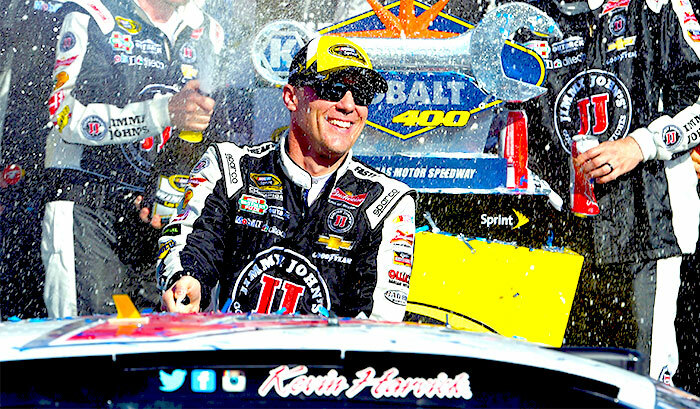 NASCAR kicks off it's West Coast swing this weekend in Vegas, and eyes will be on Kevin Harvick to see if he can replicate last season's run. The No. 4 dominated the desert in 2015, leading 366 laps between wins at Vegas and Phoenix before snagging a second-place finish in Fontana. With two top-10's to start the season (including an impressive fourth-place run in Daytona) the 2014 Sprint Cup Champion could be poised to make a return trip to Victory Lane this weekend.